Style Savvy: Fashion Forward is the third installment in the Style Savvy series! The game adds lots of new content to the series along with tons of new items and customization options. 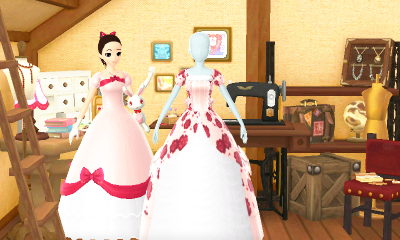 Despite never being much into fashion myself, I’ve always loved the idea of dress-up and the games continue to be one of my favorite series. While the game isn’t perfect, I feel it adds a lot of things that I hope will become staples in future series–possibly also taking from some stuff not included that had been introduced in the second game. Regardless, I’ll save most of my thoughts to the main entry. There’s a lot to say and the game really is much better than its predecessors so if you enjoyed the previous titles, you should definitely pick this one up too! 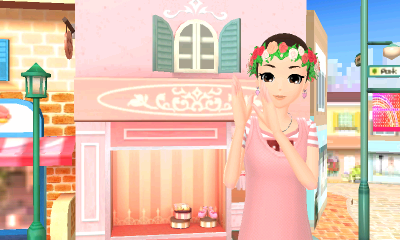 I’ll start with character customization as for a fashion game, that’s really the biggest draw to the series. This game has the most so far with over 19,000 items and thankfully, they are not just hundreds of different colors of the same item spread across several brands. Plenty of older items are back as well as new ones. Unfortunately, many items still have the issue of unique tints that makes it near impossible to find perfectly matching items. And while there are lots of new items, those several different colors of the same item across several different brands still exist. 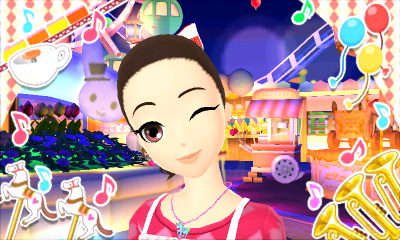 Earrings are now featured in the game which is really nice, though, they share a slot with glasses which is a bit odd. While it works for my character as I don’t usually use glasses, it’s unfortunate for people who do use both. If you’re more into how your character looks physically, you’ll be happy to know there are over 1,300 Hair Combinations. 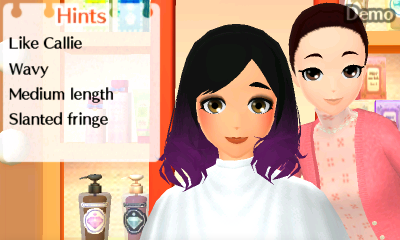 You can choose bangs separately for most hairstyles and there are tons of colors to choose from (plus highlights!). 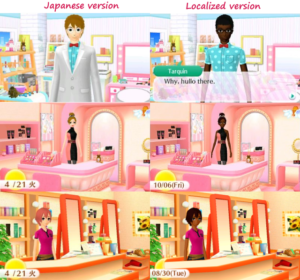 Once you beat the main story, you can change your character’s skin tone whenever you’d like and make-up still continues to be part of the game as well. Character creation is also pretty great. While I’d have preferred more eye color, hair color and hair style choices at the start, it does make up for it in other ways with being able to select freckles and beauty marks, 25 Eye styles, 20 eyebrows, 15 lips, 8 skin tones, and height (once again just the 3 like in Trendsetters) to choose from. Sadly, body types are all the same still. Maybe one day we’ll get body variations. As for guys, unfortunately male character creation is still not a thing. Considering the update Japan got where you essentially were able to make a dream boyfriend, I was really hopeful we’d finally see it as I know a lot of guys who enjoy the game. It’s an even further blow as selling male clothes has been removed completely. You can still dress-up men as a side mode, but you have all the clothes already and you can’t actually get money from it so it’s something that can be avoided altogether. I never really bothered with the male stuff in Trendsetters, but I still would’ve preferred a feature I don’t use over a feature gone forever. Even if selling male clothes is gone, I do think the option to make a male character should exist. 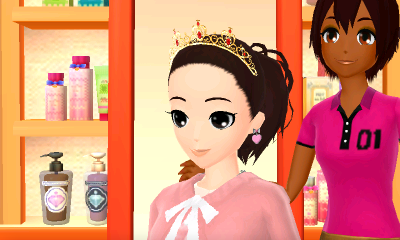 Feature-wise, rather than just the clothing shop, you eventually get the ability to help out at the Hair Salon, Make-up Salon, be a Model, and Design your own clothes. 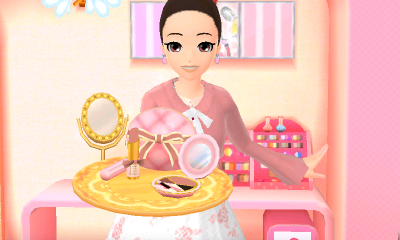 I would’ve liked to have the Hair and Make-up actually be part of my own store, but it’s not the end of the world. I think the nice part about this though is it gives you a way to earn money when you may be low on stock at the clothing store or just need a break. Because of this, it may take a while for you to get the colors you want. To unlock colors, you now need to earn them from Rainbow through photos you take. It’s a cute side-quest kind of thing, but I’d have preferred to have all the colors ahead of time and she be used for some other kind of mode. It gets especially frustrating at times as while time of day is one thing, some colors require certain seasons and if it’s a color you really want, you may be in for a long wait. Such as how I must wait until Spring for the final shade of pink :( It is kind of fun though–but it took longer than I’d have liked to get the hair color I wanted. 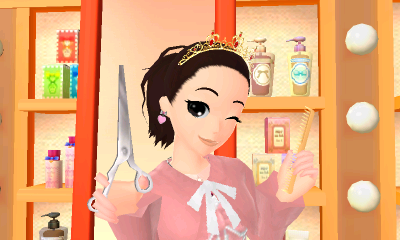 Similarly, if you haven’t unlocked the features to do hair and make-up yet, you will have to deal with the randomness of getting your hair and/or make-up done by their respective owners. They simply ask what you feel like and that is what you will get. 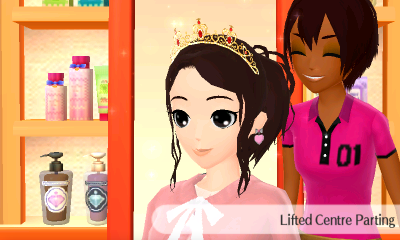 Not to mention while make-up is just tied to colors, hairstyles are unlocked based on what styles you give to customers. Most Customers do have specific requests, so if you’re really hoping for a certain side tail or ponytail, it may be a long while before you’ve done enough to unlock them all. Customers at the Beautician are also just much easier to work with. They will usually show you a photo of what they want (which you can flip over for a memo telling you what color each section is from) or just let you do whatever and be happy with it. Sometimes they will even just buy a Make-up set. At the Hair Salon, you’re first given two questions to ask. One of these will help you and lead to two additional questions. The other will not and instead relay the same two questions (which will not always be in the same order). You can ask three questions total. Once three questions have been asked (even if they are all the same one), you will have to start doing their hair. While you do get up to three chances to fix it if you did it wrong (or they “forgot to mention something”), it can also be super frustrating and I wish they would say right out what they want or even have a photo option similar to make-up. 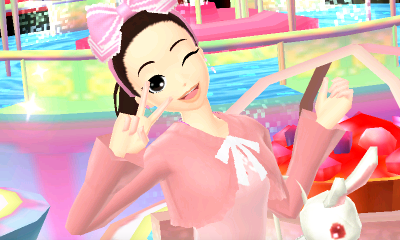 Modeling is pretty cool and offers you lots of fun poses for photos you can take. 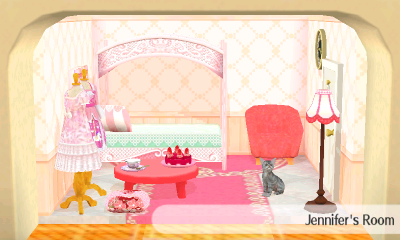 I love the decorative frames and it’s just a nice side option in the photo studio. While not actually part of the modeling job, I also want to talk about the Fashion Show. You get to actually dress yourself up for once instead of just models and even get to control your actions on the runway. It’s very nice being able to do it yourself. Unfortunately, this gets old incredibly fast. You have to do the fashion show three times for the story. After that, you get to choose the theme and venue design freely. Once tickets sell out, you can start the show which is fine– great even. For the first time. Ricky will constantly keep you up to date on how close you are to filling the venue, and once you do, you get another mail and an annoying quest marker that will stay there until you do another show. It won’t go away. This is just an endless stream of shows. And while in the second game it was easy to ignore it or even speed it up, it’s not possible in this one. You DO get miniatures from it, and it’s a great way to sell out of items you have lots of in stock. Many people will come to your shop to buy whatever kind of outfit you were wearing during the show. Unfortunately, that doesn’t make it less repetitive. 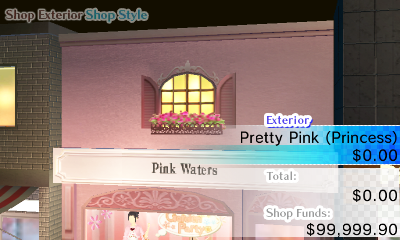 Designer is one of my favorite features as it is a huge improvement to the Collaboration feature from the very first Style Savvy game. 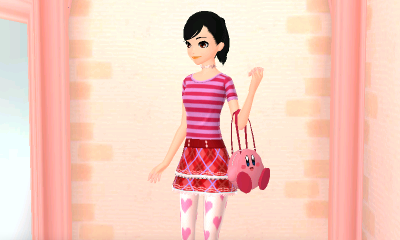 You’re able to make Shirts, Skirts, Pants, Dresses, Tights, Shoes, and even your own emblem to put on things. Though, one of the downsides is the colors you can use are restricted to only those you’ve found so far. Another is that you need to keep doing Collaboration requests to unlock everything, and there is some randomness involved. Part of which is the day of the week, which means it could take a while until you’re prompted to finally make what you wanted to. While the Emblem has all colors unlocked from the start, it’s pre-set palettes. You can’t pick and choose from all the available colors. One other issue is that the emblem is really the only thing you fully get to design– everything else is just picking patterns, decorations, and colors from what you’ve unlocked. There is just so much more they could do with this and I really hope that if it returns, they do a lot more with it. Sadly, the online store from the past two games does not return. It would’ve been great to sell our designs through it and I always loved putting up special coordinated outfits and finding ones I really wanted, but have not been able to unlock yet. Custom clothing is able to be shared through you room address if you display any, but with such limited options with just how much you can do with Clothing, it’s not really enough to matter and I enjoy sharing other clothes instead. While character customization got a huge improvement, customization for everything else was largely knocked down and missed opportunities they could’ve taken. Room customization is gone altogether for the new Dollhouse rooms at Caprice Chalet. While it offers you a bit more customization in what you can choose to put there with available items, the room is incredibly small and you couldn’t even recreate your Trendsetters room with that many items. If the room was a lot bigger or could be expanded, I feel it’d be a lot better… but I still don’t think this was enough of a reason to remove the bedroom/apartment customization that was included in Trendsetters. Similarly, I was really hoping the Shop interior would work like your apartment did in Trendsetters, but it’s once again just a style selection you get to pick from a list. You can select three different items (the same ones you buy from Dollhouse Miniatures) to put around the interior you select, but it still feels incredibly lackluster. The exterior also receives this problem, which is now just one set– you can no longer pick the walls, door, sign, and outer display separately. This seems like such a shame as the new item placement thing could’ve worked well for the latter. I could’ve put a cake on a table and even specified what plant, what table, what chair and even what floor pattern and there was just so much opportunity for something great that I feel was completely missed. 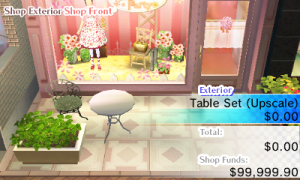 The window display is in the exact same boat, in which everything for the Mannequin itself is pretty much the same, the only things you can do for the window display is pick one of the Backgrounds– which also selects what items can go in it and the floor decorations. 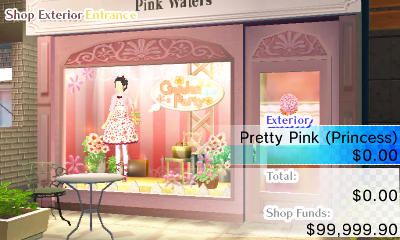 You can’t choose any customization decals (like sparkles), a setting (I loved having mine set as a tea party), or the floor separately. You just get stuck with a full background and whatever two platforms it comes with for you to put items on. There’s just so many issues here that are super disappointing when there is so much customization in the game. I’d love to see an update that improves this, but if not I hope it’ll be improved in the next game. As for 3DS related functions, the game is compatible with Amiibo. They essentially cause special NPCs (created based off the Mii registered to them) to spawn, who will give you a special item if you sell them an outfit they love. 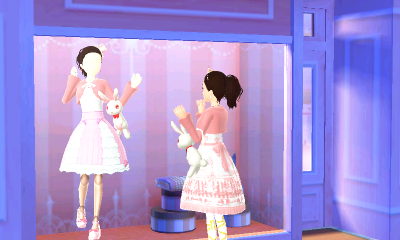 There’s also StreetPass where you can share your dollhouse room and receive others in return. 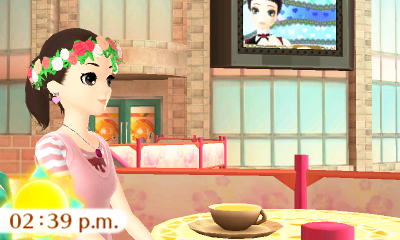 I love both Amiibo and StreetPass so I’m glad Style Savvy incorporated them (and StreetPass for a second time no less!). Finally, the game is back to real-time like the first game which is something I have mixed feelings about. While it doesn’t seem to effect anything beyond the time of day for the most part– stores are always opened and no story events are locked out. However, there are Holidays and special photo events that you could miss plus some colors and other unlockables depend on the season and time of day. I would’ve preferred if it took the route of Girls Fashion Shoot or Harvest Moon where you start in a specific month/time and then as you go through enough days or reach a specific goal, the next month hits. So you could play a year in a day, sure, but time would still pass too. It’s still much better than Trendsetters, where you could beat the entire game in the same month. I’m happy I’ll be seeing other seasons as I work on completing the game. The main issue though is that you can still do so much in a day and time isn’t a factor–its just how much time you put into it. 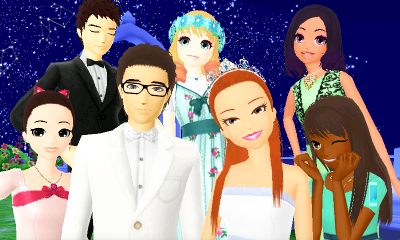 An example is one of the final things you do in the game is help a certain character get married to someone she met because of the outfit you made her for the first time. For me, this happened like… a day ago tops. Or characters mentioning how it’s been a few days when it has only been a few hours at most. It kind of takes you out of it a bit and while I don’t mind not having to wait a number of days to progress, it feels like the real time system is useless beyond certain events. One of the nice things though is everything is a lot more fluid in the game. Things around you will move and you can even go places without being invited. While you won’t have everywhere right away, being able to freely travel around and explore is really nice. People will also wander around a lot more so you won’t always see the same people in the same places. Finally though, I want to bring up some localization stuff. Japan received the game roughly a year and a half ago. Europe got the game about a year ago. North America finally got this game about a week and a half ago. And I can’t figure out why we were delayed– the only thing I’ve seen removed is the option to pick what currency you use. All the grammar, the fashion terms (I have learned what Wellies are now), the spelling… It is ALL British English. “Mum”, “Colours”, etc. It was not even changed. Would we even have gotten the game if they didn’t just bring the PAL version over? It doesn’t seem like it and that is pretty heartbreaking. We’ve always gotten the games pretty close to eachother and this just feels sort of… cheap. Not only did we wait for a long time, but there were no changes– we still have the European versions of the styles as well and when you’ve played the US versions previously, you look at this and just don’t have that instant recognition because these are completely different terms. 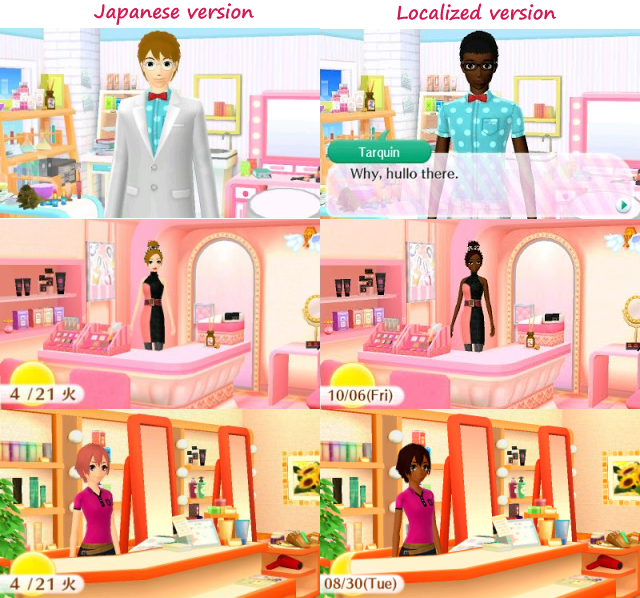 The Localized version also changed some of the NPC’s appearances which I guess was to feature more ethnicities. Though, I’m not sure if they did a great job of it, or understand why they changed some of Tarquin’s attire. 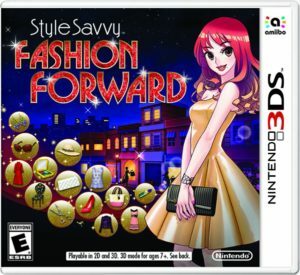 Overall, Style Savvy: Fashion Forward is an amazing game in the series. Character customization is great and I really enjoy all the new features. Interior & Exterior customization needs a huge upgrade though and should not have been downgraded this much. Hopefully the next game in the series can be even better!